The Motorcycle Skills Assessment (MSA), The Motorcycle Skills Test (MST), and the Parking Lot Test. It’s called alot of different things but it all means the same. 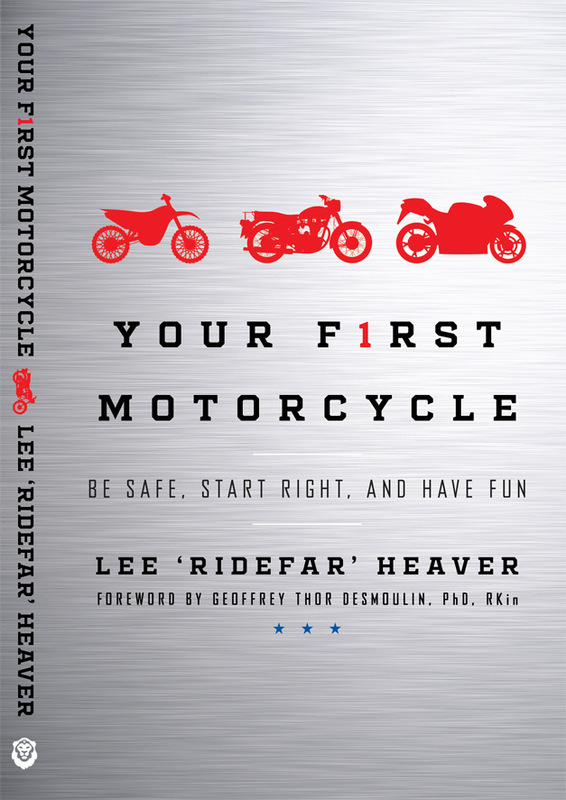 This is the 2nd step in getting your full motorcycle license. You can take this test at ICBC or with us (providing you take the full Learn to Ride course). The reason for this is test is to ensure you can operate your motorcycle slowly and quickly. Riding a motorcycle slowly is much more difficult than riding quickly. The MSA certainly highlights this fact! Practice of this test is highly recommended but we would say the toughest aspect of this test is the testing environment itself. Everything has to be done consecutively with no retakes. There are four ways to attempt the MST/MSA. 1) Take our full Learn to Ride Course where we can test you at our facility. Group or Private Lessons. 2) Take our MST Prep Course. MUST have previous riding experience. You must be able to ride already. Please book your ICBC MST at the Burnaby ICBC location. Call them at 1-800-950-1498. Book at time between 1100am and 200pm. Monday to Thursday only. No Fridays. Call/Email us to setup a time; 778 714 4327. We train you two hours before your test time. $200. Motorcycle & Gear provided. MST Course explanation. Up to 60 minutes of practice of the MST course. We then bring the motorcycle to the Burnaby ICBC location so you can use it for the MST Test. This option is ideal for out of province/country riders looking to transfer their license to BC. 3) Private Lesson with us using your motorcycle or ours. $120/hr. You must be able to ride. This is not a learn to ride option. We setup the MST course on our training lot and we teach and you practice. 4) Book your appointment with ICBC and use your own bike. We use a Honda Grom for the MST test. It is the easiest motorcycle to pass the MST test on. There are no license restrictions taking the MST test with this motorcycle. The Honda Grom is in the video below. The MSA is made up of 4 parts. Part 1 is a Slow ride, stop, U-turn, and slalom. For the slow ride you will need to use your clutch and we recommend to rev the engine and ride your rear brake. This helps with stability. After the slow ride you will stop, wait for instruction. The U-turn can be done several different ways but it must be done within the cones. You will either need to ride the clutch or you can use momentum. It really depends on what kind of motorcycle you’re riding. Remember to look where you want to go! Right after the U-turn (without stopping) you will slalom between five cones and stop. This is Part 1. 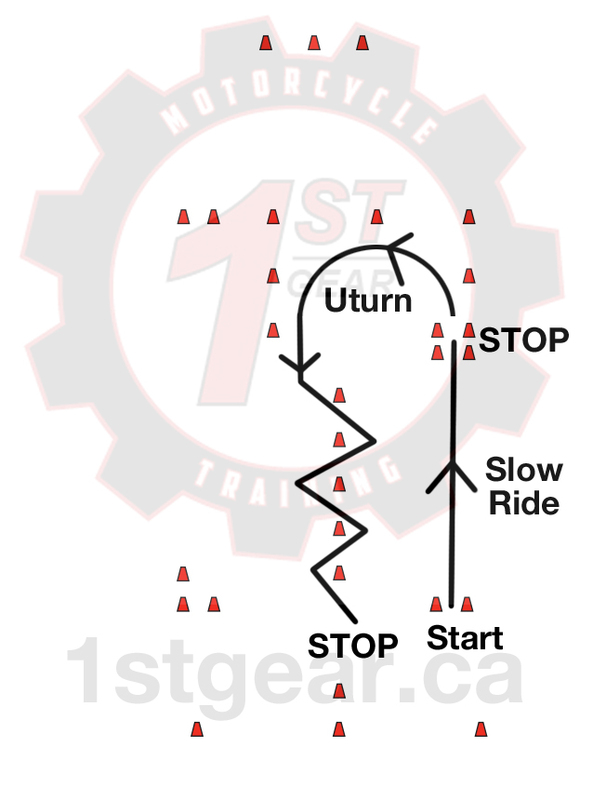 Part 2 is a left turn from a stop, slow ride, stop, U-turn, and slalom. Essentially the same maneuver you just did. The only difference is the left turn. Get momentum, look left and continue into the slow ride without stopping. After the slow ride you will stop, wait for instruction. 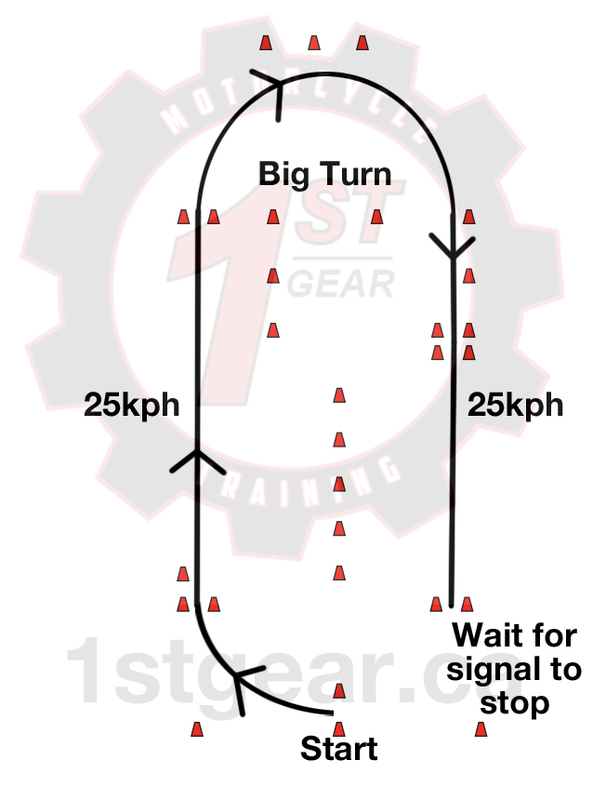 The U-turn can be done several different ways but it must be done within the cones. You will either need to ride the clutch or you can use momentum. It really depends on what kind of motorcycle you’re riding. Remember to look where you want to go! Right after the U-turn (without stopping) you will slalom between five cones and stop. Part 3 & 4 are exactly the same. You will start with a right turn. Get forward momentum and then look where you want to go. Once you complete the right turn get up to 25kph quickly. No need to shift unless you want to. Slow down before the corner. Take the big turn, looking where you want to go. Straighten out and get back up to 25kph. Hold 25kph and wait for the signal to stop. This is critical! You cannot anticipate the signal to stop. Do not cover the controls. Do not ease off the throttle. Head and eyes up looking straight forward. Once you get the signal come to a complete stop (ensuring you are 1st Gear) smoothly and progressively. Avoid locking up the rear brake, if you do release it immediately. Once you have come to a complete stop, wait for instruction. You will do it all over again. After the second time you have completed the MSA. At this point they will tell you to shut off the bike and they will explain your Pass or Fail. The most common reasons people fail the MSA is the U-turn and the Quick Stop. The U-turn requires momentum. Do not attempt this at 1-3kph. You need more speed. Once you have the momentum then look where you are going and DO NOT look anywhere else. 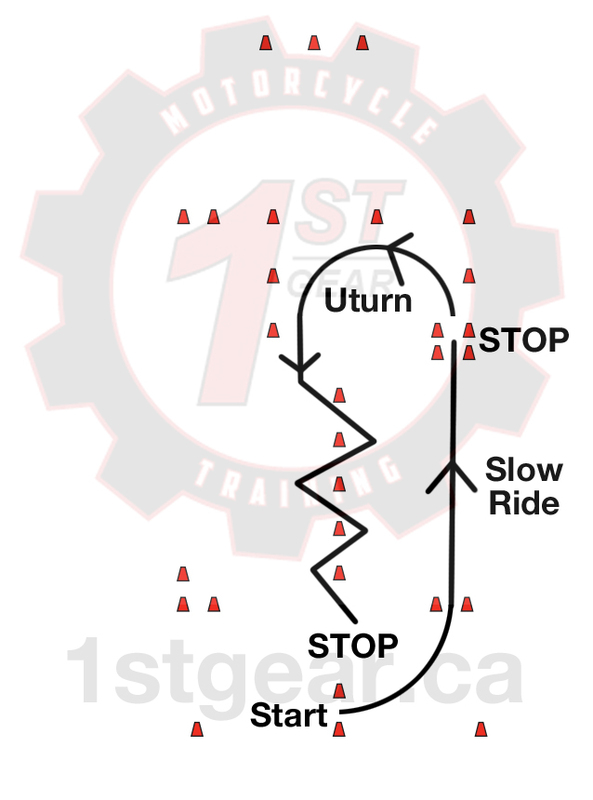 The Quick Stop is challenging as you have a certain amount of distance to complete it in. Locking up the rear brake increases your stopping distance immensely. It is very important to have a good feel for the motorcycle you’re riding. Remember to relax. Motorcycle riding is about feel, being too tense will make it more difficult. Do you have a question about the MSA? Ask us!